INTRODUCTION—Single port laparoscopic surgery (SPLS) has gained popularity albeit remaining a controversial topic. SPLS allows the surgeon to complete entire surgical procedure, like partial colectomy, through a peri-umbilical incision. Modifications of operative technique can allow the performance of colectomies using a single port, without additional access sites and without mini-laparotomy. An optimal indication for SPLS procedure could be the laparoscopic assisted right hemicolectomy—where the planned extracted site also serves as the site of the single port device. Proliferation in publications of SPLS has occurred since 2007. However, since the inception of SPLS, there has been limited evidentiary support asserting its benefits on incisional hernias. Through retrospective investigation of incisional hernia occurrences and numerous possible associated comorbidities, we propose a higher incidence of incisional hernias associated with SPLS right colectomies. METHODS—A retrospective review of SPLS right colectomies (SPLSRC) was conducted from January of 2009 to June of 2011. We performed sixty-eight single port laparoscopic right colectomies during the study period. Thirteen patients were excluded due to inadequate follow-up. We collected the following data from all patients: age, surgical indication, prior abdominal surgery, surgery duration, estimated blood loss, length of stay, intra-operative complication, post operative complication, ASA classification, specimen length, BMI, prior hernias, incision length, lung disease, tobacco use, coronary disease, diabetes, hypertension, steroid use, and preoperative albumin. All surgeries were performed using a single port trocar. Vascular pedicles were ligated with energy intracorporally and anastomoses were created extracorporally. The data was analyzed using Student’s t Test and Fisher’s Exact Test. 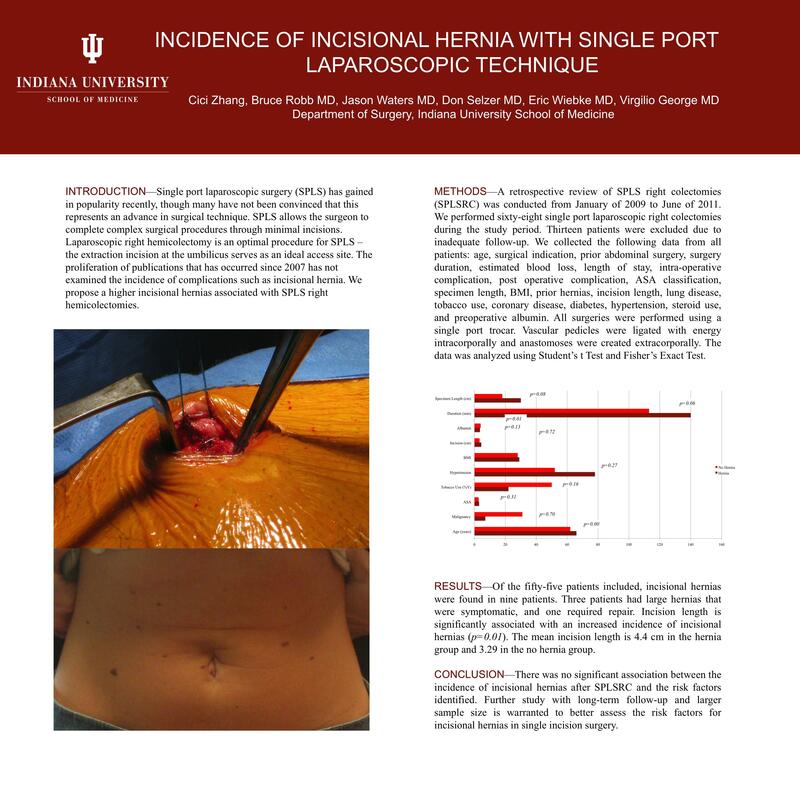 RESULTS—Of the fifty-five patients included, incisional hernias were found in nine patients. Three patients had large hernias that were symptomatic, and one required repair. Incision length is significantly associated with an increased incidence of incisional hernias (p=0.01). The mean incision length is 4.4 cm in the hernia group and 3.29 in the no hernia group. CONCLUSION—There was no significant association between the incidence of incisional hernias after SPLSRC and the risk factors identified. Further study with long-term follow-up and larger sample size is warranted to better assess the risk factors for incisional hernias in single incision surgery.